Garson, G. D. (2014). Path Analysis. Asheboro, NC: Statistical Associates Publishers. Instant availablity without passwords in Kindle format on Amazon: click here. Tutorial on the free Kindle for PC Reader app: click here. Obtain the free Kindle Reader app for any device: click here. Delayed availability with passwords in free pdf format: right-click here and save file. Register to obtain a password: click here. Statistical Associates Publishers home page. 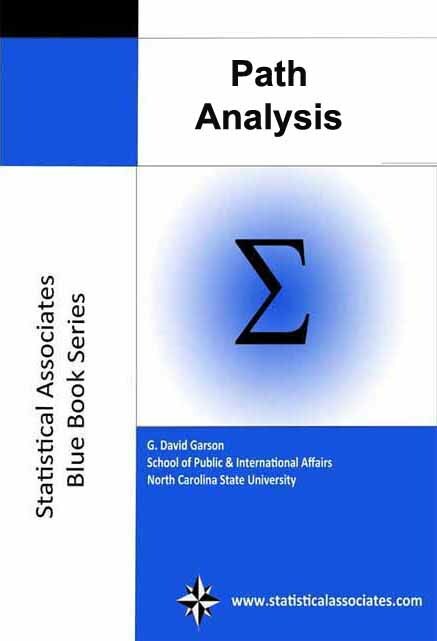 @c 2014 by G. David Garson and Statistical Associates Publishers. worldwide rights reserved in all languages and on all media. Permission is not granted to copy, distribute, or post e-books or passwords. An illustrated tutorial and introduction to path analysis using SPSS, AMOS, SAS, or Stata. Suitable for introductory graduate-level study. Links to download datasets used in the text. The full content is now available from Statistical Associates Publishers. Click here. Below is the unformatted table of contents.